BRENDA, McSaawa known in showbiz as the Biker Girl has called on civil society, organizations and parents to help put an end to streetism in Ghana. According to her, children deserve a home, love and quality training to become competent future leaders as they will contribute their quota to the nation's development and must therefore not be left on the streets. She said it is necessary for every individual to channel their little resources in equipping all kids, educating them for a better brighter future. 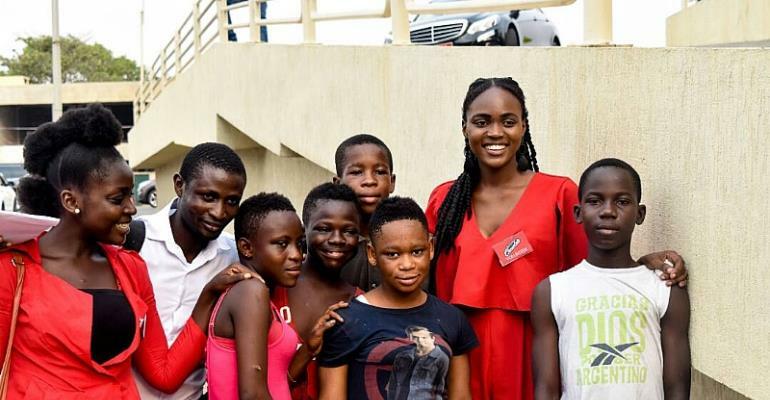 The 2017 first runner up of Miss Communicator at the Ghana Institute of Journalism made this call on Wednesday 14 February 2018 when she and her friends organized the maiden edition of chocolate donation to some streets kids as part of Valentine day celebration in Accra.
'' Today is a day of love and we need to show love to everyone most especially street kids. These kids should also be in school or homes where they can have the opportunity to school and be given the right care and training so they can be people who contribute good to society. If they live in a world where people are usually mean to them, they will only become monsters who will haunt us in the future. Street kids also need people to treat them like people".' She stated. The initiative which was marked under the theme "Beeyond Chocolate" has distributed over five hundred bars of chocolate and biscuits to streets kids living around some principal streets in the Greater Accra region. The team visited areas like and among others Opeibia, Accra Mall, Marina Mall, Shiashie all in Accra. The Biker Girl was confident of eradication of streetism as she said lessons learned from the first initiative would be put in use to organize same successful projects in subsequent years. Meanwhile some beneficiaries who received the offer shared there ordeal that led them to the streets and they expressed gratitude to the Biker Girl and Team's gesture.